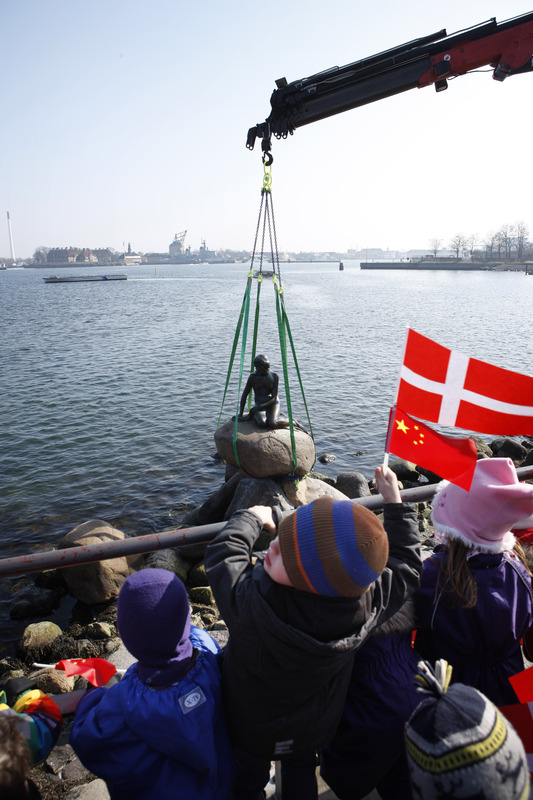 Copenhagen’s statue of The Little Mermaid, known from H.C. Andersen’s fairytale, began her journey to Shanghai on March 25. Once there she is to be part of EXPO 2010 in Shanghai. This means that around 70 million people will experience the iconic symbol of the Danish capital. She has been beheaded twice and has had her arm cut off, but The Little Mermaid has never left her native country. On March 25 The Little Mermaid began her journey around the world to be part of the world exhibition EXPO 2010 in Shanghai from 1 May to 31 October 2010. Her departure was marked by a Danish/Chinese ceremony at Langelinie, where the Minister for Economic and Business Affairs, Brian Mikkelsen, and the Lord Mayor of Copenhagen, Frank Jensen, wished her bon voyage. The Little Mermaid will be situated in the Harbour Pool in the centre of the Danish Pavilion at EXPO 2010. Here visitors get the opportunity to try some of the best aspects of Danish city life themselves. They can ride around the Danish Pavilion on a city bike like a true Copenhagener or have a picnic on the roof top. The loan of The Little Mermaid is part of a cultural exchange between Denmark and China. While in Shanghai, world renowned Chinese artist Ai Weiwei has created a video installation to be installed at her spot – so tourists visiting the waterfront of Copenhagen won’t be disappointed. – We participate in EXPO 2010 to brand Denmark and Danish values to the Chinese and all visitors from around the world who visit the Danish Pavilion. Our loan of the Little Mermaid to China shows that we Danes are interested in other cultures and want to share our art and cultural treasures with them. – We are proud to lend the Little Mermaid to China. I am convinced that she will be an excellent ambassador of Denmark, particularly since the Chinese already are very fond of Hans Christian Andersen and his fairytales. At the same time I am delighted that Ai Weiwei’s video installation will make it possible for the Danes to follow her throughout her journey.